There's something distinctively tranquil and decadent about lunching while surrounded by rows of art canvases. 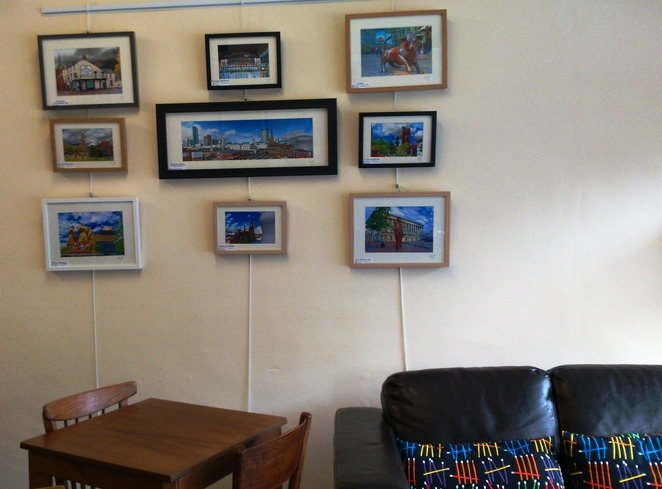 Hidden away in Edgbaston and close to the office hub of Five Ways in Birmingham, is The Artwork Cafe, a peaceful haven that has transformed what could be a local greasy spoon into something much more special. The Artwork Cafe can be found among a scattering of shops at Templefield Square, off Wheeleys Road, in the leafy Birmingham suburb. 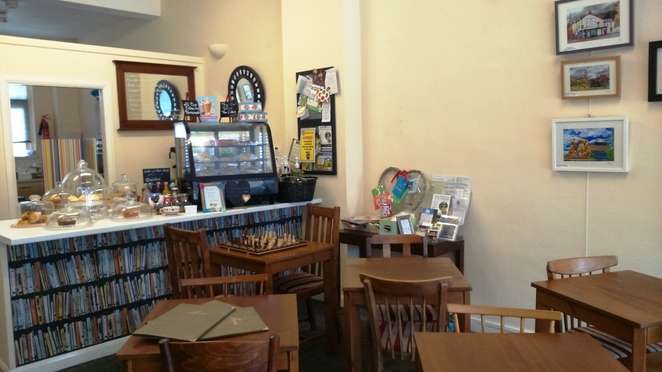 It has a welcoming, calm atmosphere with wooden tables and chairs, some sofa seats and cheery staff behind the counter. The real treat, however, are the walls, which are covered in art by local artists. 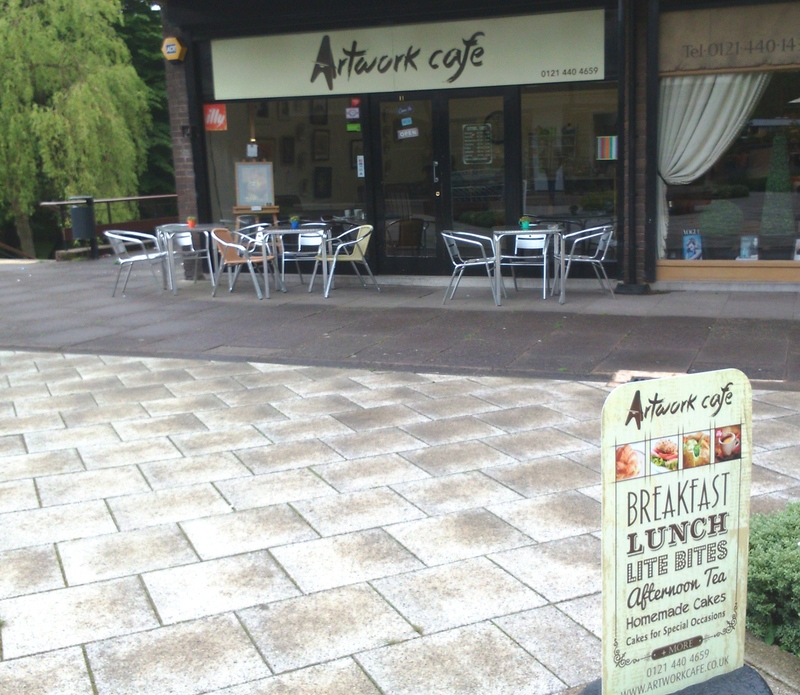 Promoting itself as an "artwork exhibition cafe", owners allow local artists to sell and exhibit work. There are some wonderful pieces that range from classic paintwork to more futuristic digital work. All of it pleasing to the eye and mind. I particularly liked the range of images that depicted parts of Birmingham in bright, vivid colours but the selection regularly changes, so there is always a reason to go back and see what's new. Amid these fine, creative surroundings, visitors have a wide selection of coffees, sandwiches, paninis and the usual lunchtime selections to choose from, but there is also a plentiful supply of cakes - all homemade. The cakes are so good that the cafe also supplies them for birthdays and weddings, but sweet-toothed diners have other temptations too including an afternoon tea option and teacakes. Prices are fair and not expensive - a slice of cake for a few pounds and coffee and tea from upwards of £1. It's good quality coffee as well with brands like Illy used at the cafe. Free WiFi is on offer for customers too. This charming little haven doubles up as quite the social centre too as The Artwork Cafe also encourages creative activities and is keen to be used for book club gatherings, craft classes, jewellery making sessions and the like. Free parking is available at the square.